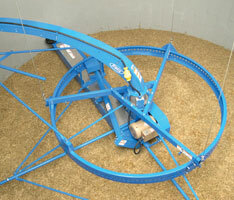 Convert your current Patz ring drive silo unloader to an A1® Series II Single Auger Silo Unloader. 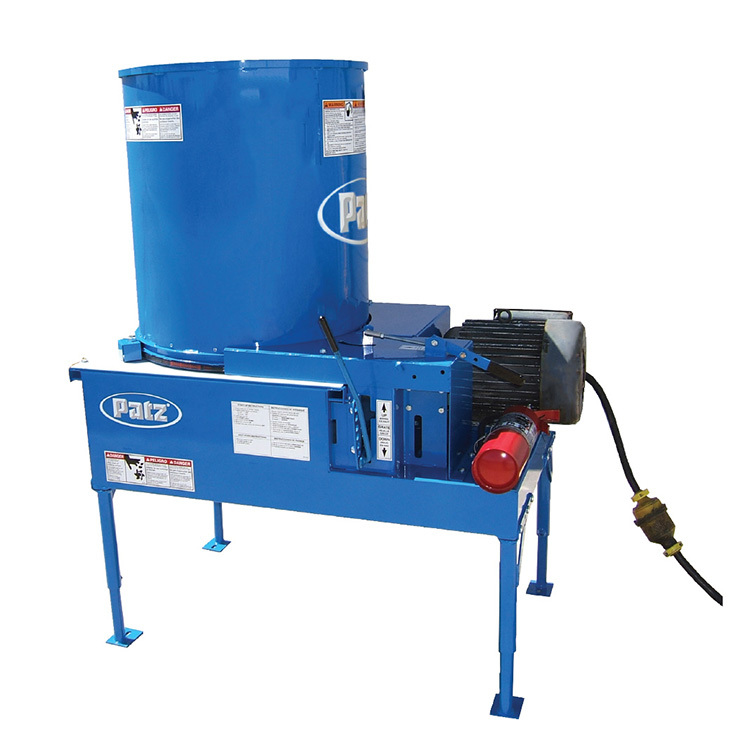 Contact your local Patz Dealer today. Heaviest, reversible ring in the industry! Heavy 7-gauge (4.5 mm) thick steel, 9 foot (2.74 m) diameter (3 section) ring is flanged to the inside for greater strength and is reversible for greater life. 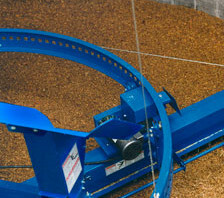 Provides maximum stability for proper machine balance in changing silage conditions. Power to the drive sprocket is transmitted from a rugged ring drive gearbox that is shaft driven (one motor drive) or totally enclosed, motor driven (two motor drive). The Patz ring drive torque limiter features a farm proven radial-pin design to provide accurate torque release under adverse conditions of hard-packed and frozen silage while protecting the ring and drive system. 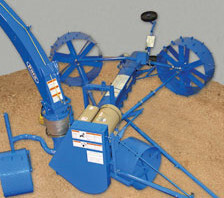 Heavy-duty 10” (254 mm) high-capacity auger is made with 1/4” (6.4 mm) thick flighting. 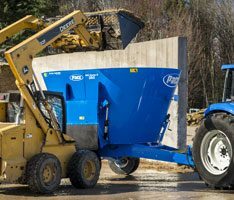 Double flighting at the chipper wheel end, and double kickers at the blower end of the auger provide smooth operation while removing the hardest packed and frozen materials. 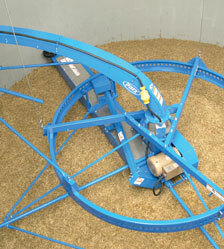 6 self-sharpening steel knives welded securely to chipper wheel to clean silo wall. Two 10" (254 mm) diameter wall wheels. Adjustable, long-life heavy-duty polyethylene wall wheels for accurate positioning of chipper wheel. An adjustment bolt on each wheel allows for a more precise setting of wheels. 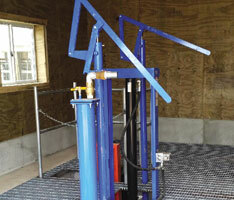 3-point suspension system keeps unloader level, eliminating the need for counterweights. Choice of suspension arms to fit tripods or hexapods. 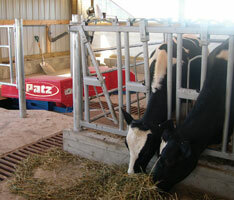 Optional high clearance suspension arms available for hexapods (16'-24' models) to add extra feed storage and lift. 3-cable suspension using high-tensile strength aircraft cable, provides the ultimate stability of unloader. Includes the strongest main cable in the industry at 3/8" diameter! 26" (660mm) high capacity blower features 3 cupped, adjustable paddles to deliver high volumes of silage. Paddles feature stainless steel pins and can be mounted fixed or swinging to ease start up. Air intakes into the blower reduce air resistance for more throwing power. Blower band is made of 1/4" (6.4 mm) abrasion-resistant steel for longevity. Patz offers the hexapod with the highest lift in the industry! Optional high clearance suspension arms provide extra feed storage and clearance for filling with 16’-24’ models. The hexapod’s 3-cable suspension includes the strongest main cable in the industry at 3/8” diameter!